In 2010, a product known as EX-RAD made headlines that it can reduce damage from radiation exposure. It was one of those cases where science fiction actually turned into reality, as Rad-X was the name of an anti-radiation drug from the post apocalyptic game series Fallout released 13 years prior. Results from the radiomitigation experiment (where the drug is administered after exposure to lethal radiation), using both injection and oral methods of delivery demonstrated that Ex-RAD® treated animals had comparably high rates of survival in both groups. Hence, oral Ex-RAD® was found to be effective in both prophylactic pre-treatment and mitigation post-treatment settings. Source. Onconova Therapeutics, the Pennsylvanian company that developed this drug in conjunction with the US Department of Defense has find an interesting way to to deal with radiation poisoning: Instead of stopping the cell cycle or scavenging for free radicals, it opens up a mechanism to sense damage and repair DNA pathways. The CEO and co-founder of Onconova, Ramesh Kumar, believes this is a better method than scavenging free radicals, as they are short lived and would narrow the window of opportunity to make the drug effective. How well does it work? Below is an image of the DNA comet assay, which is a way of measuring DNA damage. In this test, the longer the length the of comet, the more damage is done. here we can see that Ex-RAD reduces the length of the comet tail. The lethal dose of radiation for humans is about 4.5 Gy. As it is still in initial phases, it may be a few years yet before it goes to the market. It takes an average of 12 years for a new drug to go from lab to pharmacy. Onconova Therapeutics is listed on the NASDAQ as ONTX. It was founded in 1998 and became publicly listed in 2013. Its been a very long time and no post - a few years in fact. Its been difficult to keep tabs on 'post apocalyptic' happenings in the media just because there has been so much of it. As far as my own voice was concerned, I felt like I didn't have too much new to offer with so much new post apocalyptic work being done in the arts. This subject still interests me; just call it a bad case of blogger's block. So I will put my toe in the water once again and observe what the latest trends and figures are for 'post apocalyptic' over the decades by digging into Google Trends, Wikipedia articles, and Google Keyword Planner (an advertising tool). We are half to the next decade and it looks like film and it looks like the output of post apocalyptic films will double before 2020. This from another doubling of output from the 1990's - before then it was pretty stable. 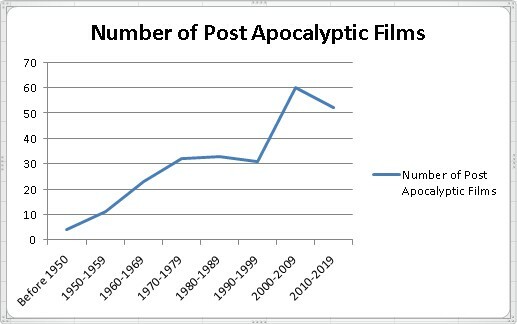 Perhaps the list isn't perfect - maybe not enough foreign movies or not 'pure' post apocalyptic - but regardless, it an interesting trend. This shows that we may have reached 'peak post apocalyptia' in early 2000's; if the current trend continues, there will be less original post apocalyptic literature in the current than in the 1980's. So while interest in the subject is trending up, as well as in films, new wellsprings of post apocalyptic art is possibly in the decline. More specifically, below are some keywords taken from post apocalyptic searches per month from Google; it shows a pretty strong interest in the arts, including fiction, film, games, television and fashion. Not outrageously high number counts, but it displays that there is still a healthy interest in the subject matter. So based on these rough indicators gleaned from online research tools, it looks like post apocalyptic interest, especially in the arts, is increasing. The only caveat would be that perhaps original work is on the decline, with a greater emphasis on serialised content. Is this a bad thing? Some very popular films and games spanned decades such as Mad Max (1970's, 1980's, 2010's) and the Fallout Video Games (1990's, 2000's, 2010's). A few have jumped genres across across the decades, such as the Walking Dead - from comic book to TV series. Whilst there is debate whether sequels ruin the original, I do think the cases above the content has remained fresh. That is a testament that the genre is standing the test of time.